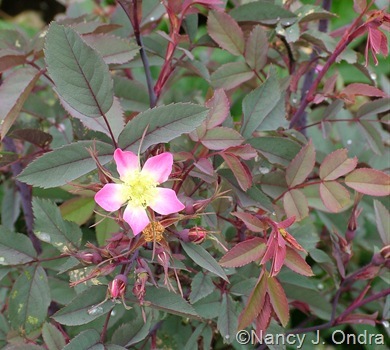 When I decided to write a series of posts exploring the meanings behind many botanical names, I knew right away which batch I wanted to investigate first: names that relate to colors. There are so many that I ended up breaking into it two parts. First up, white to black and the tones in between. There’s certainly no lack of references to white in botanical names. Most often, it’s some indication of the flower color, but it can relate to other structures too, or even to the whole plant. 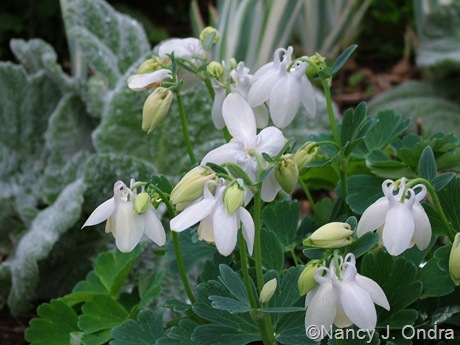 Albus (or alba or album) is an easy one to remember: Aquilegia flabellata var. pumila f. alba (white-flowered dwarf fan columbine) and Campanula trachelium var. alba (white-flowered bats-in-the-belfry) are just two examples. The prefix “alb-” is another simple clue that something white is probably evident, as in albiflorus/albiflora/albiflorum (white-flowered), albicaulis or albicaule (white-stemmed), or albifructus/albifructa/albifructum (white-fruited). Albescens indicates that some part of the plant turns white, as with the bracts of Pycnanthemum albescens (white-leaved mountain mint). Candidus (-a, –um) – as in Zephyranthes candida (white-flowered rain lily) – indicates bright white. 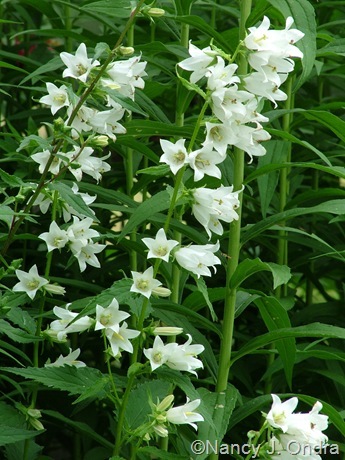 The closely related candidissima suggests a very bright white, which makes sense in the case of the pure white Deutzia scabra ‘Candidissima’ (rough deutzia) but not so much with Arisaema candidissima, which is as much pink as it is white. 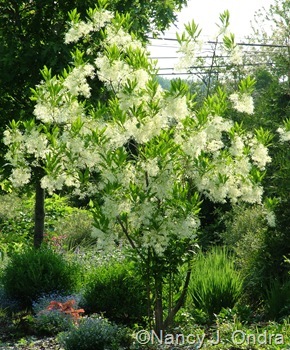 A few other terms that relate to snowy white features include chionanthus, chionantha, and chionanthum; think of the elegant Eomecon chionantha (snow poppy) or Chionanthus virginicus (white fringe tree). There’s also niveus/nivea/niveum, referring to the flowers in the case of Tanacetum niveum (silver tansy). There are epithets for less-than-pure whites too, including eburneus/eburnea/eburneum for ivory white (as in Carex eburnea [ivory sedge]) and margaritacea (-us, -um) for pearly white (as in Anaphalis margaritacea [pearly everlasting]). Lactose (literally, milk sugar) is a term that’s in common usage, so it’s easy to remember that lacteus/lactea/lacteum and the prefix “lacti-” all refer to milky white. 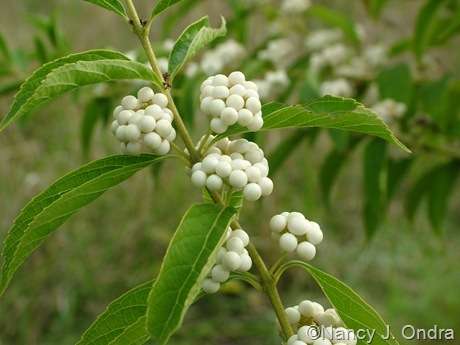 Some examples include Callicarpa americana var. 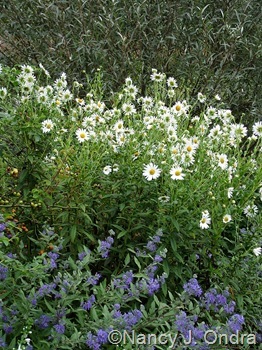 lactea (the white-berried form of American beautyberry) and Artemisia lactiflora (the white-flowered white mugwort). For creamy white, there’s ochroleucus (-a, -um) – as in Scabiosa ochroleuca. For generally pale features, there’s pallidus (-a, -um), as in Echinacea pallida, a purple coneflower that has white pollen, along with the prefixes “pallid-” (think of Fritillaria pallidiflora [the pale-flowered fritillary]) and “leuc-” or “leuco-” (as in Leucanthemum and Leucanthemella, with white flowers, or Leucophyllum, with silvery white foliage). As the color drifts toward the grayish to silvery range, there’s another group of terms you may recognize. When the appearance is gray to grayish white (usually due to a covering of hairs or fuzz), there’s canus/cana/canum, as in Agastache cana (hummingbird mint). Incanus/incana/incanum indicates an appearance that’s even more noticeably gray to grayish white; think of the bluebeard species Caryopteris incana or Marrubium incanum (silver horehound). The closely related canescens refers to being or becoming gray to grayish white; think of Amorpha canescens (leadplant), which tends to be fuzzed all over, or Rhododendron canescens (Piedmont azalea), hairy mostly on the undersides of the leaves. When a grayish or whitish (or blue-gray) cast comes from a waxy coating, you’ll often see glaucus (or glauca or glaucum), as in Picea glauca (white spruce), Rosa glauca (grayleaf rose), and Echeveria glauca (blue echeveria), to name just a few examples. Once you know what glaucus means, it’s easy to guess that glaucescens relates to becoming (or being) whitish, grayish, or bluish due to a waxy coating, as for Ferrocactus glaucescens (a barrel cactus). 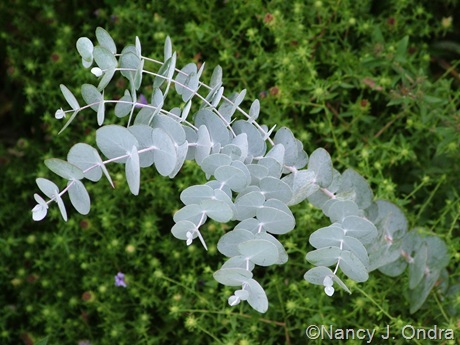 For ash-gray, there’s cinereus (–a, -um), as in Eucalyptus cinerea (silver dollar gum), Salix cinerea (gray willow), and Erica cinerea (bell heather). 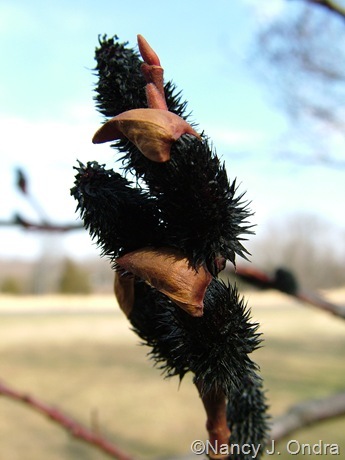 Griseus (-a, -um), as in Acer griseum (paperbark maple), is another term that relates to gray. 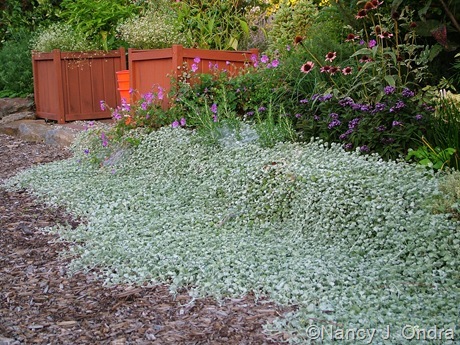 When the appearance is distinctly silvery, there’s argenteus (-a, -um) and argentatus (-a, -um): think of Dichondra argentea (silver ponyfoot), Salvia argentea (silver sage), and Plectranthus argentatus (silver spurflower). Ready for more color-related names? Click over to the next post in this series: Through the Rainbow Part I.